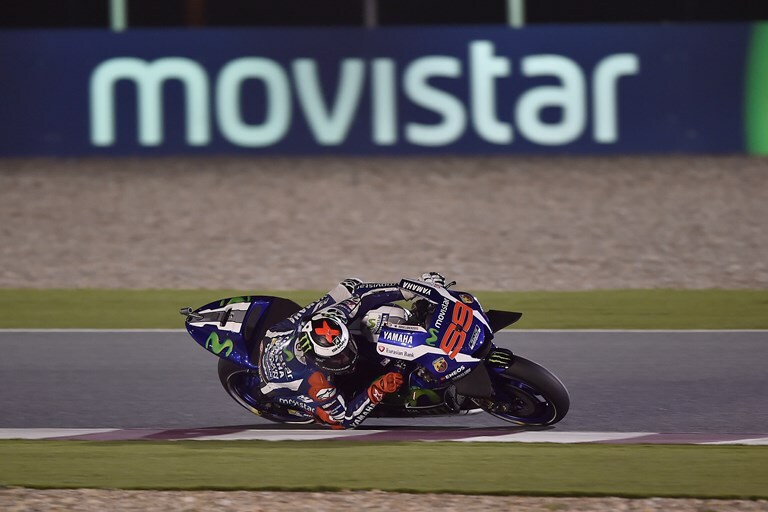 Movistar Yamaha MotoGP took its first strides towards the 2016 MotoGP title challenge today at the start of the Commercial Bank Grand Prix of Qatar. Riders Jorge Lorenzo and Valentino Rossi made their intentions for the new season clear in the first free practice session of the season under the scenic floodlights at the Losail International Circuit, securing first and second place respectively. After positively concluding pre-season testing a fortnight ago, Movistar Yamaha MotoGP team’s Jorge Lorenzo and Valentino Rossi returned to the Losail International Circuit today to officially start the 2016 MotoGP season. As if the winter stop never happened, the teammates instantly fell back into their old groove and placed their YZR-M1s 1-2 in the ranking order. Lorenzo felt confident and in a good physical shape after completing pre-season testing and his eagerness to get back into ‘racing mode’ didn’t go unnoticed at this evening’s free practice session once he hit the track. Having given the field a ‘head start’ to be guaranteed some clear space on track, he left his box as the second to last rider and immediately shot to the top of the leader board with his first flying lap. The Majorcan continued to set the bar high, dropping a 1’55.693s, more than 0,6s faster than all his rivals, around the midway stage of the session. As the pace picked up during the end of the session, the reigning World Champion responded almost with ease and wrapped up the proceedings with a best lap of 1’55.440s for the provisional lead in the standings. Rossi was also not shy in claiming a key protagonist position in the first 45-minute practice session. Similar to his teammate he left his departure from pit lane late, but was quick to turn up the heat as soon as his tyres were warmed up. Fully focused on getting his setting exactly to his liking, he worked on the balance of the YZR-M1 with the new electronics and Michelin tyres and gradually moved up the timesheets. He ended the day with a long stint during which he skillfully made the traffic on the track work to his advantage. climbing up to second position as the session came to an end and finishing 0,267s from the leading time. As Sunday’s race will be held at 21:00 (GMT+3), the format of the race weekend has been changed to enable the riders to be fully prepared for the night event. There will be a second and third free practice session held tomorrow evening. The Monster Yamaha Tech3 Team riders Pol Espargaro and Bradley kicked off their 2016 campaigns and hit the track with instant speed in the first shakedown in Qatar as they began setting up their Yamaha MotoGP bikes for Sunday’s first round battle. Pol Espargaro wasted no time in getting straight on the pace as he aims to win the fight for the leading satellite rider battle this year. The young Spaniard lapped the track 18 times and set his personal best on the final run which left him in 6th, just three tenths back from third, marking a promising start to the weekend. Meanwhile, Bradley Smith leapt into gear as he confidently began the 2016 season and after consistently gaining speed, he set his fastest time on his 13th lap whilst aiming to improve further. Yet, a small crash at turn 13, close to the end of the session, prevented Smith from ascending any higher. However, the young British remains fully confident of bouncing back strongly tomorrow.